There are nine Americans killed every day from motor vehicle accidents involving distracted driving, such as using a cell phone, texting or eating. One in four motor vehicle crashes in 2015 involved a cell phone. It has become clear the upcoming generation is immersed in a digital age, fixated with their media outlets. The Lenape Regional High School District acknowledged these tendencies that its teenagers display regularly by implementing the Heads Up, Eyes Forward initiative during the 2010–2011 school year. The idea has taken off since then, proving to be one of the most successful safe driving campaigns in the state. In fact, Heads Up, Eyes Forward has won the U Got Brains competition three straight times and four times in the last five years. U Got Brains is a statewide contest in which every school promotes its respective safe driving campaign. John Donaldson, director of television services for the school district, has taken the reigns of the LRHSD’s campaign and has made it what it’s become today. “The ultimate goal of the Heads Up, Eyes Forward campaign is to save lives,” he said. Donaldson believes it is such an effective campaign because it was created six years ago by high school students and continues to be run by them. While this age group often portrays themselves as invincible when it comes to taking orders, it’s become clear they are more open to taking advice when it is coming from people in their age group. “Teenagers are more likely to listen to their peers when it comes to being told what they should do and by having high school students be the ones to come up with fresh, new ideas for the campaign every year. We trust other students will listen to them,” Donaldson said. Donaldson also expressed his gratitude toward the faculty for the support they’ve shown. 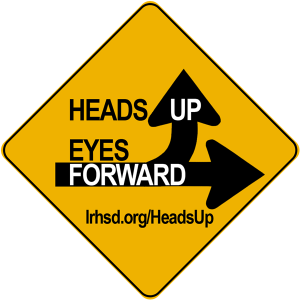 Teachers from all four high schools display the Heads Up, Eyes Forward logo on their classroom doors and even on their own cars. The schools hang posters in prominent locations, and each month, students are reminded about the safe driver of the month contest via a short video that is played on the in-house video bulletin boards. The safe driver of the month initiative began in 2014 and is the newest addition to the campaign. By keeping the Heads Up, Eyes Forward magnet on their car, students are eligible for a chance to win the vaunted safe driver of the month parking spot set in a premium location at each school that is close to the entrance. Every month, students who keep their magnet on when driving through the community are eligible to be selected at random to win the rights to the parking spot. The mission is to spread the message of safe driving to not only students but also the whole community. “By just having our magnet on their car, other drivers out on the road will hopefully see it and think about what it means,” Donaldson said. The district additionally wants to make students aware that “distracted driving” means not only texting while driving, but anything that takes the driver’s attention off the road. Devon Geisler of Seneca High School, Rachel Young of Cherokee High School, Alec Patrowicz of Shawnee High School and Stephanie and Alexandra Pappas of Lenape High School were January’s safe driver of the month parking spot winners at their respective schools. February’s winners will be disclosed on the district website, lrhsd.org. All students are encouraged to endorse the campaign by picking up a free magnet in their school’s main office and by always remembering to keep their heads up and eyes forward while operating their vehicle.